Meguiar's luxurious leather formula combines cleaning, conditioning and leather protection formulas to safely and conveniently clean, moisturize and protect your fine leather. 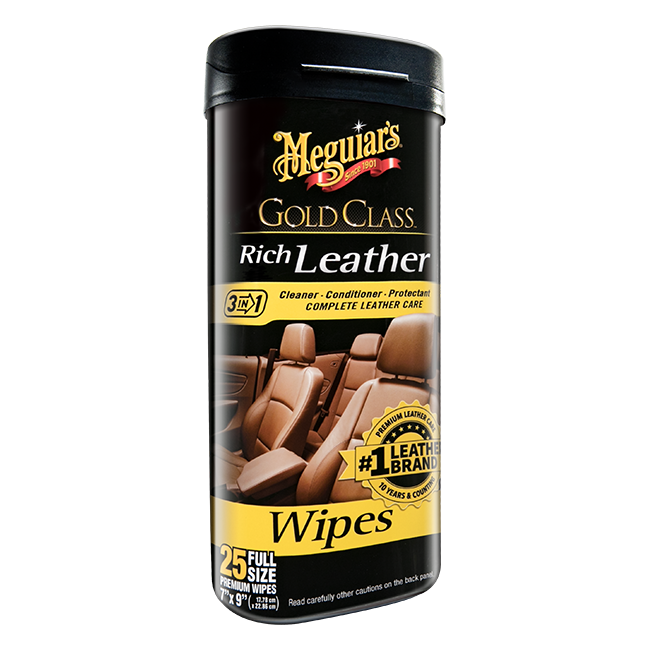 Meguiar's super luxurious textured wipe material is saturated with high levels of rich moisturizers, including aloe, to pamper your fine leather while protecting from spills, stains and UV damage. Provides long lasting protection to fine leather surfaces. 25 per container. Mothers Leather Conditioner - 12 oz. This all and one wipe is Great for leather, vinyl and plastic, I have been using it for a couple of years now and it works on everything. It leave a lasting low gloss shine and protects very well. It also leaves leather interiors soft and supple like an old leather glove. This is the best car care product there is, it cleaned my Old Bonneville leather seats. It shines and cleans the seats the seats where old and Brownish and now there completely white now. Very Sweet! When you sit in them its very firm and unlike Armor All it doesn't slide and have a slick feeling to it. Meguiars makes the Very Best!!! Very AWESOME PRODUCT!!! This product is great for touchups on leather seats. Use between more agressive leather conditioning.